Japanese ninja are skilled in the art of stealth, secrecy and surprise. I’m wondering if Father Time is the original ninja. The arrival of the holiday season has caught me off guard. Thanksgiving is next week! AND Christmas trees sporting ornaments and tinsel line Beverly Hill’s Rodeo Drive. Thanksgiving may have to be a fend for yourself sort of affair. But, I did stop reeling from the dizzying blow and realization that Christmas is nearly here. I baked up a batch of ginger chocolate ninja cookies donned with Santa caps. Almond Marzipan Candy Caps on Chocolaty Ginger Ninja Santa. As I cut out the ginger chocolate ninjas out of the rolled dough, I had pangs of missing my ebullient great-nephew. (He’s living in Qatar with his mom and grandma at the moment.) Holiday magic and miracles do prevail for adults and children alike. But, there is an extra sparkle to the season when believers of Santa are near. The senses are heightened. Scents of melting chocolate, butter and cinnamon seem sweeter. Even without my little great-nephew around, though, my baking ninjas exuded heady scents of ginger and chocolate. I’m grateful to the Creative Cookie Exchange for choosing a November ginger theme. 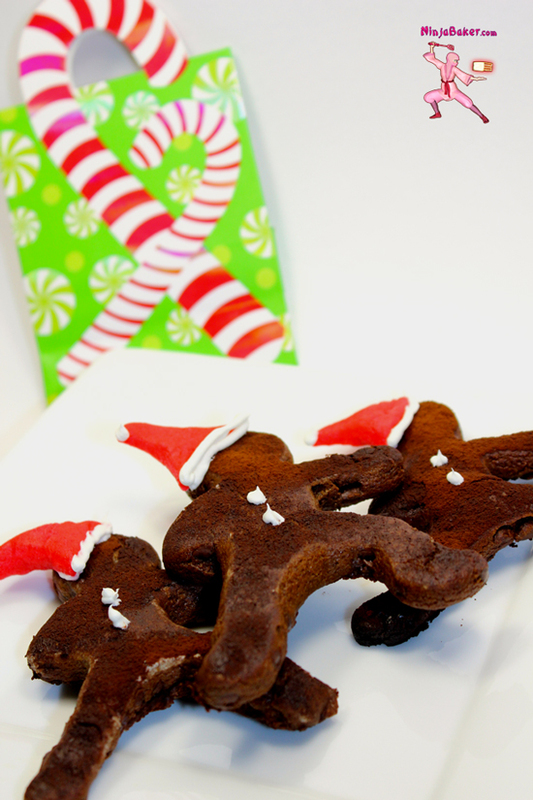 Thanks to the cookie-baking maestros, I’ve now got yummy ginger chocolate ninja Christmas Santa cookies ready! Ginger Chocolate Ninja Santa Cookie Power! 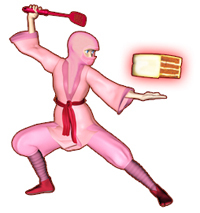 Ninja Note: Initially, the only chocolate components to the ginger cookies were mini chocolate chips. But as I gingerly placed the cookies on the baking sheets, the white flour marring the golden color dismayed me. So, I sprinkled unsweetened cocoa atop the ninjas. My ninja cookies benefited in appearance and taste. As for taste, the ginger chocolate ninja cookies are a beautiful blend of ginger and chocolate. Happy Holidays! Wishing you happy holiday ninja moves in the kitchen and in the shopping malls!